Sorel – serious winter boots – and stylish too! And they no longer seem to make them, but I saw a woman with a plaid pair of Sorels that would have gone great with some Burberry. Who is twitter for ? Everyone. Even plants! “answers the question: What’s up with your plant? It offers a connection to your leafy pal via online Twitter status updates that reach you anywhere in the world. When your plant needs water, it will post to let you know, and send its thanks when you show it love. Twitter is social software that asks a simple question: What are you doing? It is interesting to see that Google is joining a consortium to essentially pump up the Internet. This is not surprising: Google has the money, and it is in their interest. What I find interesting is thinking that the torch is passing from the telcos to the software companies. It will also be interesting to see how this affects the whole net neutrality discussion. Whatever happens, it will be interesting to see Google’s foray into the world of infrastructure. See the post on the New York Times Blog – Bits: Google and the Undersea Cable. businessweek.com has a good article that shows the challenges China has in transforming itself from being a producer of cheap goods and other people’s goods to being a producer of goods that are highly valued and Chinese. It’s a road Japan has travelled many years ago. 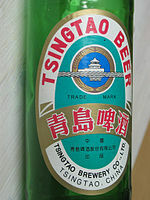 See Budweiser, Miller…and Tsingtao?